Last Wednesday, Facebook released its hotly anticipated Facebook Messenger Bot API, allowing developers to, for the first time, create bots that can respond automatically to messages on Facebook. After a few days of trial and error and scrounging around the Facebook Bugs forum, I successfully got a bot up and running (and even picked up two hackathon prizes along the way)! This tutorial will lead you through the process of creating a messenger bot from start to finish, using the Facebook Messenger API, node.js, and ngrok. 1. 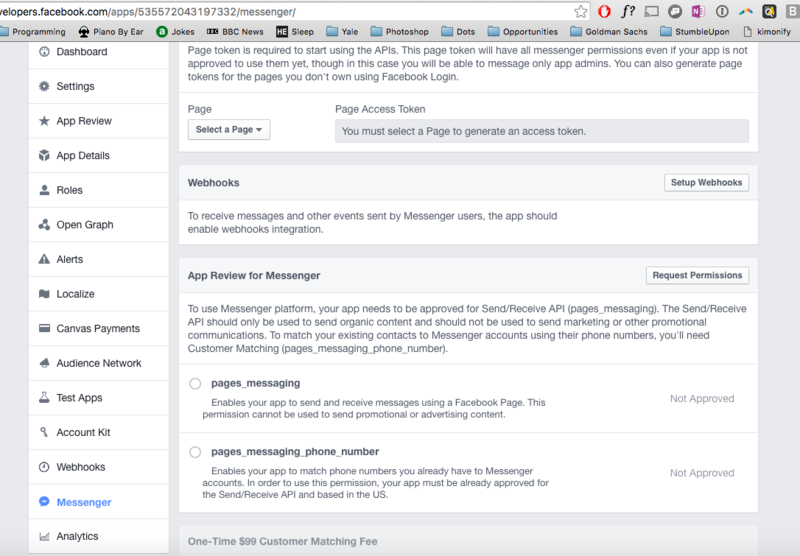 Create a Facebook App and Facebook Page. As the first step in the Facebook Getting Started walkthrough explains, the name and profile picture of the page you create will be the name profile picture of your bot. It's alright if your page is unpublished and your app is in sandbox mode, but you will only be able to message app admins. Note that my Facebook Developer dashboard looks a little different from that in the screenshots of the official getting started guide, since those in the official guide seems to be from a newer version that hasn't been rolled out universally yet. 2. Install messenger-bot, a node client for sending and receiving messages. First, make sure you have node.js >= 4.0.0 installed. Then, open up terminal, navigate to the directory you want to host your project in, and run: npm install messenger-bot. messenger-bot is an excellent, lightweight node client that will save you the hassle of setting up a node server from scratch. Even so, the code for messenger-bot is only 131 lines, making it extremely easy to understand and further customize, if you wish. Create a new file called app.js and copy-paste in this code, originally taken and modified from messenger-bot's examples directory (Note: if you copy-paste directly from github, it won't work!). Go back to your Facebook app page and replace PAGE_TOKEN in your app.js file with your actual token. Feel free to leave VERIFY_TOKEN as is; if you change it, be sure to use the same token in step 4, when you set up your bot's webhook subscription. To run your server, type node app.js in your terminal. If there are no error messages, that means your server is working! *Of course, if you want your bot to be available 24/7 even when your computer's not running, you'll eventually want to deploy your server to a third-party hosting service like Heroku, AWS, or Azure. Just don't forget to update webhooks and run the curl command (steps 4 and 5) from that server as well! 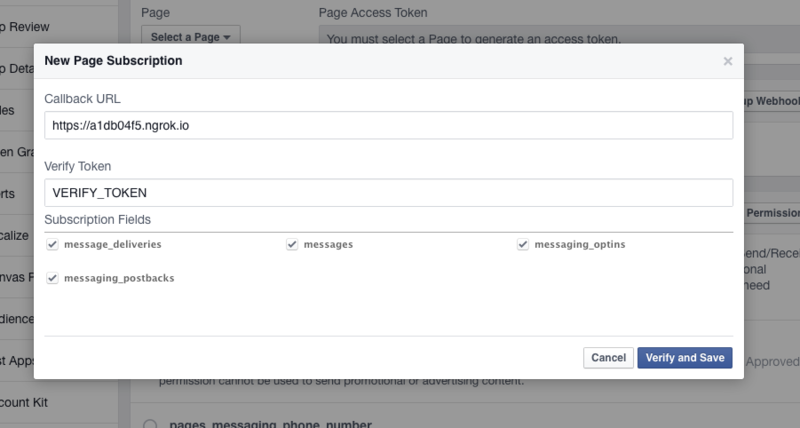 curl -ik -X POST "https://graph.facebook.com/v2.6/me/subscribed_apps?access_token=<token>"
replacing <token> with your Page Access token (from the Token Generation section of your app's messenger dashboard). 6. Message your bot! 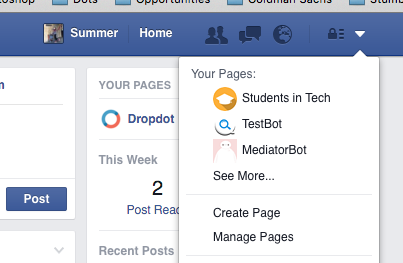 Go to your bot's Facebook page, click "Message," and say hello! It should echo back whatever you send it. Demo of starting a mediation session with MediatorBot! And there you have it: your very own messenger bot! Try editing app.js and looking over messenger-bot's README documentation to customize your bot. 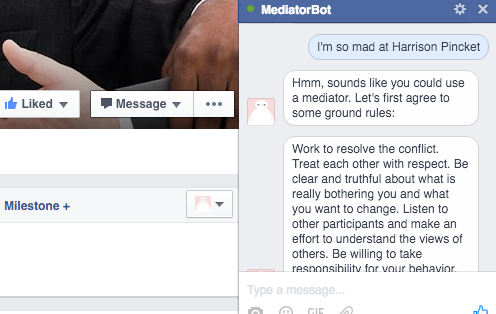 At Copenhacks, Harrison and I built MediatorBot, a bot that mediates disputes between two parties (Github link). We've temporarily unpublished our Facebook page to give us a chance to refactor some code and make our logic more robust before releasing back into the wild. If you're looking to develop an intelligent, adaptive bot, it might be worth looking into bot engines such as wit.ai and api.ai, which allow you to train your bot using examples and stories. Although these engines ended up being too limited and inconsistent for what we had in mind for MediatorBot, they could serve businesses with a more formulaic service-oriented goal well. Additionally, I'm sure both of these engines will continue to undergo rapid improvement, as they both have robust development teams behind them (wit.ai is reportedly developing Facebook Messenger's M, a personal bot assistant that's currently only available in the San Francisco Bay Area). Best of luck with your bots, thanks for reading, and feel free to post your questions, comments and feedback below!